Disturbing evidence about Canadians’ working conditions came to light in an 1889 Royal Commission report. Factory employees, miners, firefighters, textile and other labourers were working 12- and 13-hour days, sometimes nights, six days a week. Men, women and even children toiled in unsanitary and hazardous workplaces. The Commission’s report referred to the “petty tyranny by foremen” at some sites. Employers would withhold workers’ pay, or fine them, even beat or lock up children, simply for talking or working too slowly. The Canadian government of the day did little in response to those findings. Still, conditions of work for Canadians improved over the 20th century, thanks to the efforts of people who joined together to push for change. Born in Dublin, Republic of Ireland, Sid Ryan is one of Canada’s most renowned champions of labour rights. It was a role he first became familiar with as a child, upon watching his father organize his fellow workers in Ireland in their battle for greater labour rights. 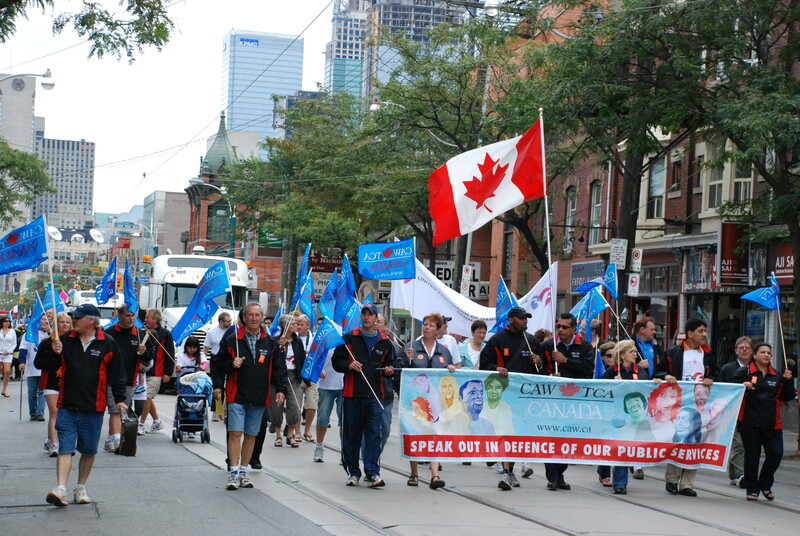 Currently serving his second term as the President of the Ontario Federation Labour – Canada’s largest provincial labour federation – where he represents 54 unions and over one million workers, Sid made his mark in the labour movement as the head of CUPE Ontario for 17 years. A vocal proponent of workers’ rights, human rights and social justice, Ryan’s unwavering position on these and other issues have given him a reputation as both an activist you want on your team and an at-times polarizing figure. We caught up with the firebrand at his OFL office in Toronto where he spoke about his passion for labour rights, the evolution he’s seen in the movement, the challenges of the past and those that keep him impassioned today – and the moments that make him most proud. Patricia McDermott is a professor of women’s studies and socio-legal studies at York University in Toronto. She’s been exploring the intersection of women’s rights and the labour movement for close to 40 years. And she’s the playwright of Life on the Line: Women’s Strike at Eaton’s 1984-85, about the six months Eaton’s workers spent on the picket line, struggling against one of Canada’s largest retailers. The strike was one of Canada’s most renowned and the workers received support by the labour and women’s movement, among other communities. Rallies were formed as well as candlelight vigils, marches, a concert a Massey Hall and a national boycott of Eaton’s, with many customers cutting up their Eaton’s credit cards. 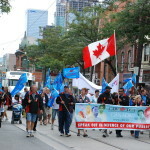 The strike inspired a call for reform of contract legislation in Ontario and its issues still underpin the challenges today’s worker’s face. Today McDermott is focused on the labour movement’s other challenges such as precarious work and the fight for the $15 minimum hourly wage. In this digital story Sid Ryan talks about his father’s influence on his activism and the varied struggles he fought for over the years as a champion of the labour rights movement in Canada. In this podcast, Sid Ryan explores the evolution of the labour movement and the challenges that exist today. He shares the highlights of his career that makes him most proud, including the fight for social justice and human rights issues. And he talks about the need for collaborative efforts among Aboriginal communities, environmentalists and other activists. In this digital story, professor and playwright Patricia McDermott examines where her passion for strikes and unions originated and how her activism and focus on women’s rights led her to write a play on the Eaton’s Strike of 1984. In this podcast, McDermott, who has been exploring the labour movement and its impact on women’s rights for 40 years, discusses the Eaton’s Strike, its place in Canada’s history and impact on the labour movement. She also shares the various challenges facing workers today including precarious work and low wages.